Ulysses S. Grant and General Orders No. 11: How the infamous order changed the lives of Jews in America. How a notorious anti-Semitic order changed the course of Jewish life in America—ultimately, for the better. Photo from Brady-Handy Photograph Collection/Library of Congress. 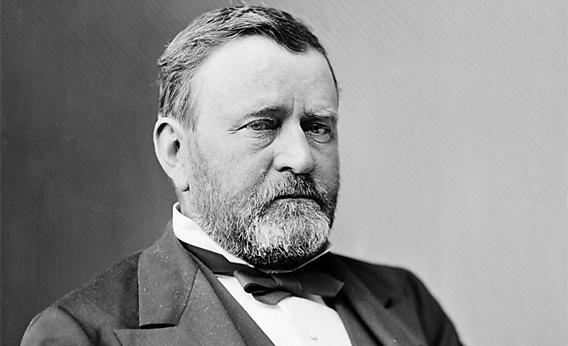 Americans today are often surprised to learn that Ulysses S. Grant once expelled “Jews as a class” from his war zone. It seems incredible that he could blame Jews for the sins of smugglers and traders—most of whom were not actually Jewish at all—and expel them from the entire territory under his command. Some Jews at the time wondered whether their new homeland was coming to resemble anti-Semitic Europe at its worst. In the end, only a small number of Jews were seriously affected by General Orders No. 11. Within hours of its issuance, Confederate Gen. Nathan Bedford Forrest staged a daring raid that tore up rail and telegraph lines around Grant’s headquarters at Holly Springs, Miss. The resulting breakdown in communications meant that news of General Orders No. 11 spread slowly. Eleven days later, when Jews were belatedly expelled from Paducah, Ky., one of those affected, Cesar Kaskel, rushed to Washington to protest. With help from Cincinnati’s outgoing Republican congressman, John Addison Gurley, who had ready access to the White House, he was able to see Abraham Lincoln at once. But like any trauma, General Orders No. 11 turned out to have lingering effects. In the short term, it brought to the surface deep-seated fears that, in the wake of the Emancipation Proclamation, Jews might replace blacks as the nation’s most despised minority. Some Jewish leaders explicitly feared that freedom for slaves would spell trouble for Jews. Later on, in 1868, when Grant ran for president, the memory of General Orders No. 11 sparked passionate debates between Jews who extolled Grant as a national hero and those who reviled him as a latter-day Haman, the enemy of the Jews from the Book of Esther. The issue thrust Jews, for the first time in American history, into the center of the political maelstrom. The excruciating question that Jewish Republicans faced—should they vote for a man who was good for the country, even if they thought he was bad for the Jews—prefigured a central conundrum of Jewish politics, the question of multiple loyalties. Those who injected General Orders No. 11 into the presidential campaign plainly sought to appeal to Jewish voters on the basis of their religions. But was it legitimate for Jews to base their vote on such considerations? Or should they cast aside their special interests and consider only the national interest? Should General Orders No. 11 single-handedly determine how Jews vote, or ought they, as responsible citizens and voters, weigh the totality of issues facing the country before making up their minds? Still later, during the eight years of Grant’s presidency, memories of General Orders No. 11 surfaced repeatedly. Eager to prove that he was above prejudice, Grant appointed more Jews to public office than any of his predecessors, and, in the name of human rights, extended unprecedented support to persecuted Jews in Russia and Romania. Time and again, partly as a result of his enlarged vision of what it meant to be an American and partly in order to live down General Orders No. 11, Grant consciously worked to assist Jews and secure them equality. The story of General Orders No. 11 and its lingering impact fills in a missing and revealing “Jewish” chapter in the biography of Ulysses S. Grant. The order and its aftermath also shed new light on one of the most tumultuous eras in American history, the era of the Civil War and Reconstruction. During these years—America’s “Second Founding” as one historian terms it—the definition of what America is and who “We the People” should include convulsed the country. Most of the debate naturally centered on the status of black people, but there was likewise substantial debate concerning the Jews. Though they formed less than 1 percent of the population at that time, Jews were by far the most significant non-Christian immigrant group in the nation and their numbers had been increasing rapidly—from about 15,000 in 1840 to some 150,000 on the eve of the Civil War. General Orders No. 11 implied that these Jews formed a separate “class” of Americans, distinct from their neighbors, and subject, especially when suspicions of smuggling fell upon them, to collective forms of punishment, including expulsion. The National Reform Association, which was particularly active during the 1870s, went further, seeking to “declare the nation’s allegiance to Jesus Christ.” A “religious” amendment, proposed repeatedly during the Grant years, on the theory that the Civil War was punishment for “the absence of any adequate recognition of God” in the nation’s founding documents, looked to write Christianity directly into the Constitution itself. Against this backdrop, Ulysses S. Grant’s surprising embrace of Jews during his presidency takes on new significance. Through his appointments and policies, Grant rejected calls for a “Christian nation,” and embraced Jews as insiders in America, part of “We the People.” During his administration, Jews achieved heightened status on the national scene. Judaism won recognition (at least from him) as a faith co-equal to Protestantism and Catholicism (”the [P]rotestant, the Catholic, and the Jew appointed days for universal prayer in my behalf,” he boasted to his eldest son on his deathbed). Anti-Jewish prejudice declined. And Jews looked forward optimistically to a liberal epoch characterized by sensitivity to human rights and inter-religious cooperation. In the president’s mind, a direct parallel existed between the treatment of blacks under Reconstruction and the treatment of Jews. Indeed, he described “respect for human rights” as the “first duty of those set as rulers over nations,” and specifically included both blacks and Jews as being among the unfortunates whom “those in authority” should go out of their way to protect, “to rescue and redeem them and raise them up to equality with the most enlightened.” He sought to create new opportunities for members of both minority groups. Ulysses S. Grant was as popular as George Washington and Abraham Lincoln in the late 19th century, but in the 20th his reputation fell under withering assault. Historians, many of them southerners critical of his benevolent policy toward black people, criticized both the way he waged war and the way he forged peace. They blamed him for the Civil War’s high death rate, for the failures of Reconstruction, for the corruption of his underlings, and for his personal failings. They derided him as a butcher and a drunkard. Historians ranked him close to the bottom among all American presidents. In recent years, however, a thoroughgoing re-evaluation of Ulysses S. Grant has taken place. “Though much of the public and even some historians haven’t yet heard the news,” historian Sean Wilentz observed in the New York Times, “the vindication of Ulysses S. Grant is well under way. I expect that before too long Grant will be returned to the standing he deserves—not only as the military savior of the Union but as one of the great presidents of his era, and possibly one of the greatest in all American history.” A fresh look at Grant’s relationship with the Jewish community reinforces this view. It shows how General Orders No. 11 and its aftermath transformed Grant’s career—sensitizing him to prejudice and teaching him to treat members of minority groups as individuals responsible for their own actions. General Orders No.11 also greatly strengthened America’s Jewish community. The successful campaign to overturn the order made Jews more self-confident. The tempestuous 1868 election, where so much ink was spilled concerning the “Jewish vote,” taught them much about politics, and about the power—real and perceived—of a well-organized minority group . The fact that Ulysses S. Grant selected, for the first time, a Jewish adviser (Recorder of Deeds for the District of Columbia Simon Wolf), appointed a series of Jews to public office (including Edward S. Salomon, governor of Washington Territory, and Dr. Herman Bendell, superintendent of Indian affairs for the Arizona Territory), and, as president, attended the dedication of a synagogue further enhanced Jews’ self-confidence. It is always easy to exaggerate the political impact of a religious or ethnic minority, and Jews would have many occasions in the post-Grant years to learn the limits of their ability to win political appointments and effect public policy. Nevertheless, General Orders No. 11 marked a turning point in American Jewish history. Paradoxically, Ulysses S. Grant’s order expelling the Jews set the stage for their empowerment.